Last month, my toilet was clogged and there was a bit of backflow. We tried to fix ourselves, which made it worse. Never believe in those DIY videos. 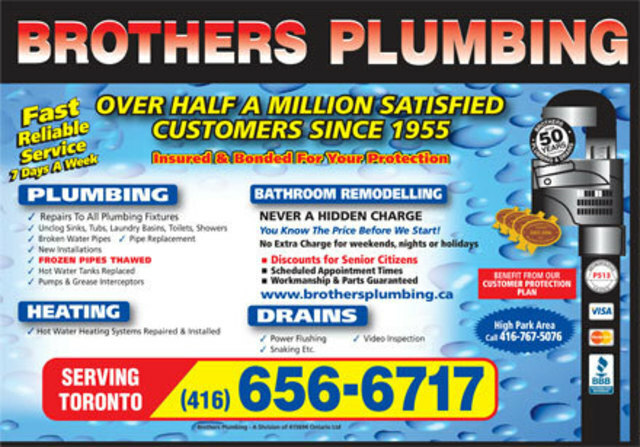 I called Brothers plumbing and they had someone at my door within an hour. They were very polite, clean and professional and had our toilet fixed. They get the job done quickly and are clean about it. Thank you for your review. We are constantly trying to improve our service and it seems we did it rite as per your kind words. Thank you. My toilet had not been flushing well for some time and I finally called a plumber. Patrick from Brothers Plumbing came on the same day as my call. He tested for a pipe blockage first but all was clear. He also tested the other toilet in the house and it was fine. He showed me the wear on the toilet's parts and said to replace them would cost about as much as a new toilet. I authorized the new toilet; he went and got it, replaced the old one, and took it away. Total elapsed time was under two hours. Extremely pleasant person and also tightened my kitchen faucet for nothing. I highly recommend Patrick and Brothers and will use them again. Thank you for your review. We are pleased to hear that you were happy with the service provided by Patrick. We are always trying to improve our service and your feedback is most helpful. Thank you again for your king words. I needed help dislodging a plastic nut on the underside of a toilet so I could change the fill valve. I had bought the replacement myself. The plumber came and was done in 5 minutes. Cost me $250. I think that's crazy steep. Thank you for your review. Sorry to hear that you were not happy with the price. Unfortunately the cost of providing service in Toronto is quite high and we have to charge accordingly. We are competitive with other companies in your service area and we always give the customer the price to do the job at no obligation. In your case I understand you had been struggling with your toilet for a few days, trying to fix it yourself. We sent out an experienced serviceman to repair your toilet and he did it right and in a timely manner. Most customers appreciate and understand you pay for good, fast service. I hope this helps explain the cost. Thank you again for your review. Brothers Plumbing was really everything you could want in a stressful situation - they clearly articulated the problem, solution and cost verbally and the written quote matched this exactly. They kept their word to the T and showed up precisely when they said they would - they continued to keep me up to date with the progress of the work, including showing me via camera feed any of the issues. The work was excellent, cleanup was all taken care of and I was provided with the paperwork to apply for a subsidy from the city, all within a tight turnaround. I highly recommend this company and the great people they have working for them. Thank you for your review. We are constantly trying to improve our service so that all our jobs go smoothly. Glad to hear that all went well. Thanks again. Patrick from Brothers arrived on time, listened carefully to the problem background, and then proceeded to methodically and efficiently diagnose the leakage through the inspection of the drywall holes that had been cut. He then fixed the issue through a toilet repair. 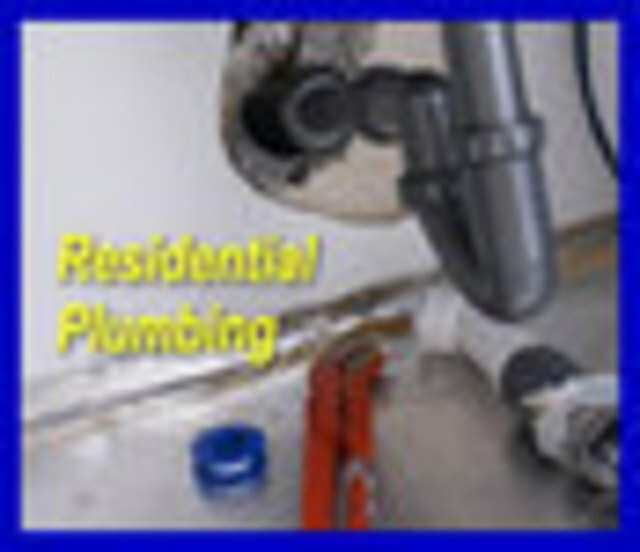 He additionally provided input on the configuration and quality of a plumbing renovation done by the prior owner that was useful and practical. Very impressive professionalism, work, and knowledge! Thank you for your review. You took the words out of our mouth, as professionalism is what we bring to all our customers. Happy to hear you were well looked after. Thank you again for your kind words. Something nobody wants or plans to get done but brothers did it fast and with minimal intrusion. The basement floor needed to be broken up and also the outside needed digging up. Ivan and his crew worked very hard and they were very polite and considerate to the family during the disruption. 10 out of 10 I would recommend and ask for Ivan, hardest working crew I have seen. Thank you for your review. We always strive to make every job run smoothly and treat our customers and their property with respect. Thanks again. Patrick from Brothers Plumbing looked after my kitchen sink where the shut off valves for the water supply and to the dishwasher started leaking a lot. I also had intermittent leakage from the sink drain which required replacement of the whole under sink drain. Patrick was courteous and friendly and completed the job quickly. Everything was neat and tidy when he was done and he spent time testing for leaks after the job was done. Thank you for your review. Our priority is customer satisfaction so we always try to explain to customers what we are doing and we always check our work. Thanks again for your kind words. Dayvid did an excellent job replacing our kitchen sink drain pipes and fixed our dishwasher hose. We had a flood the night before and he came to our house, on time and assessed the issues, replaced what needed to be done, in a very timely manner. He was kind and courteous. 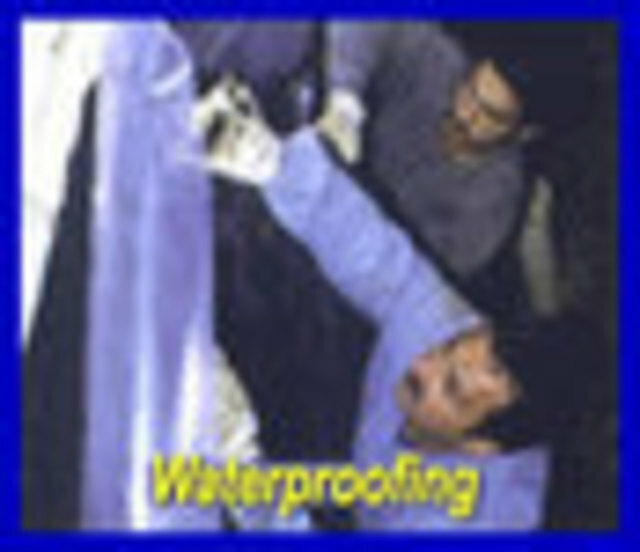 He explained everything that needed to be done and the costs were explained and reasonable. We will be calling him back for any plumbing needs in the future! Amazing service. 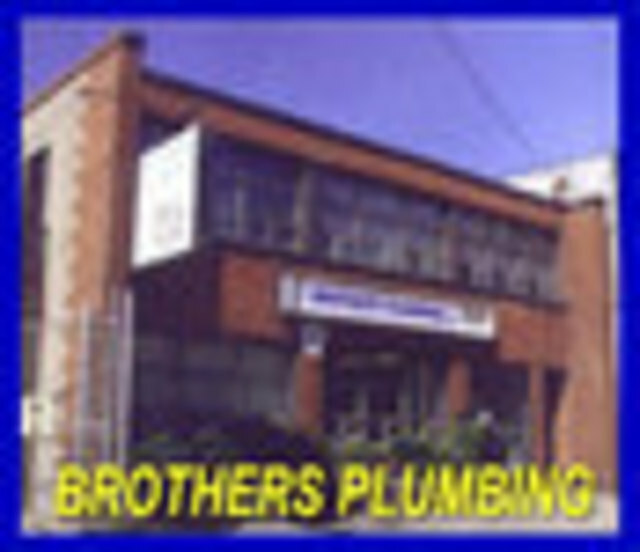 Thanks, Dayvid and Brothers Plumbing! Thank you for your review. We are always trying to service all our customers in a timely manner. Happy to hear you were happy with our serviceman. Thanks again. A few years ago, we used brothers to move a rad in our home. After the job was completed, the entire rad system did not work and we had to call someone else in to fix. Brothers claimed they were only hired to move the rad and not to ensure that the entire system functioned properly after their work was done. Inconceivable since to move the rad, the system needed to be shut down and then re-started! Once again, we hired them to move a rad, had a scheduled appointment, took the day off work to be here and when they were a no-show, advised us that they forgot to add it to their work list. Completely unreliable and they take no responsibility to solve problems related to their work. Will never use them again - strongly advise you to make a different choice. ???? No idea who this is from and what this is about. Don't know what happened a few years ago but if we did such a poor job why would you call us back? This sounds like a fake review. Every company has scheduling issues and if we made a mistake then we apologize for that but I don't think our company or any company for that matter deserves a bad review for it.